This cancer usually affects a woman after the menopause. The classic symptom is bleeding after the menopause (post menopausal bleeding, PMB). If you suffer PMB your doctor will arrange an ultrasound scan to check on the lining of your womb. 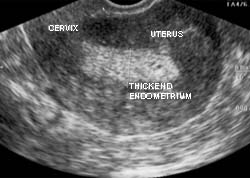 You will also probably require a hysteroscopy and biopsy of the womb lining (the endometrium).